Despite its inaccessibility (it remains untranslated and copies are hard to obtain), Vinigi Grottanelli’s Pescatori dell’Oceano indiano (1955) is generally agreed to be one of the best studies of a rural Swahili-speaking community. 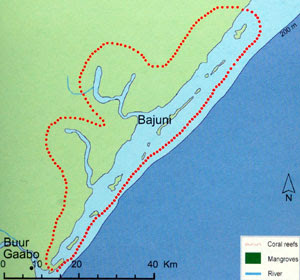 It’s our principal ethnographic source on the Bajuni (aka Gunya, aka Tikuu), whose traditional territory comprised a long string of coastal settlements and islands between Kismayu (Somalia) in the north and the Lamu archipelago (Kenya) in the south. And the political turmoil of recent decades in Somalia has turned it into a valuable historical document, a record of a way of life that for thousands of Bajuni has been shattered by persecution and conflict. The Bajuni minority in Somalia didn’t have a very good time during the regime of Mohamed Siad Barre (1969-91), suffering discrimination and a variety of indignities. From 1974 fishermen had their fishing gear and boats confiscated and were compelled to join government cooperatives, while some were force to move off the Bajuni islands (Abby 2005: 14). But matters went from bad to worse following the outbreak of the Somali civil war and the overthrow of Siad Barre in January 1991. Bajuni joined the general exodus of victimised groups from Somalia, and many of them fled to UNHCR refugee camps in and around Mombasa, where the Kwa Jomvu camp became their main home until it was finally closed down in 1998. At the time I was living in Mombasa, and remember the influx of refugees – most noticeably those who were installed in St. Anne’s, near the Manor Hotel – and the flood of cheap computer equipment that also came into the port as Mogadishu descended further into chaos. Knowing that many of the refugees had come from Brava, Kismayu and elsewhere on the southern Somali coast, I realised that this might provide an opportunity to do some research on the northernmost dialects of Swahili, Mwiini (= Bravanese) and Bajuni. The linguist Derek Nurse was planning a visit to East Africa, and I suggested this possibility to him in a letter written in May 1992. But his primary target then in Kenya was the little-known Sabaki language Ilwana: he’d already studied Bajuni and had access to enough Mwiini data to be going on with (cf. Nurse and Hinnebusch 1993: 5-7). Conducting linguistic research with Swahili-speaking refugees in Kenya might have been tricky in those early days, politically and research-permission-wise at least. The subsequent emigration of large numbers of Bajuni and others to Europe and North America has perhaps made it easier, though a generation has now grown up in a very different linguistic and cultural environment from that of their original homeland. Asylum-seekers’ histories of displacement, including their knowledge of language and place, are of special interest to the immigration authorities processing their claims and the civil society organisations and lawyers defending their rights (cf. Allen 2008). Since 2004 Derek Nurse has engaged with numerous cases of refugees claiming to Bajuni from Somalia, and this work has seen him return to research that he began in northern Kenya in 1978 (Nurse 1980). The academic fruits of this are now online in his Bajuni Database. This comprises a general overview of ‘Bajuni: people, society, geography, history, language’, a Bajuni lexicon, a grammatical sketch (that updates Nurse 1982), and three maps (one of the whole Bajuni coast, plus sketch maps of Chovae and Chula islands). These aren’t polished documents, but are very useful nonetheless. The overview – part of which is a gazetteer of Bajuni villages down to the Kenya border – is of particular interest. Very few Bajuni remain in Somalia, and their world is clearly not what it was in the days before the dictatorship of Siad Barre and the Somali Civil War. Current prospects for research on the south Somali coast and Bajuni islands don’t look good, and recording what we know of this lost world and its former inhabitants is the best we can do. It is also important for the Bajuni diaspora, and a poignant reminder of the widespread suffering that the Somali conflict has caused. Abby, Abdi 2005. Field Research Project on Minorities in Somalia. Unpublished report, Oxford House, London, October 2005. Allen, Brian 2008. The Bajuni people of southern Somalia and the asylum process. The Researcher (published by The Refugee Documentation Centre, Dublin) 3 (1): 2. Grottanelli, Vinigi L. 1955. Pescatori dell’Oceano indiano: saggio etnologico preliminare sui Bagiuni, Bantu costieri dell’Oltregiuba. Rome: Cremonese. Nurse, Derek 1980. Bajuni historical linguistics. Kenya Past and Present 12: 34-43. Nurse, Derek 1982. The Swahili dialects of Somalia and the northern Kenya coast. In M.-F. Rombi (ed.) Etudes sur le Bantu Oriental (Comores, Tanzanie, Somalie, et Kenya. Paris: SELAF. 73-l46. Nurse, Derek and Thomas J. Hinnebusch 1993. Swahili and Sabaki: A Linguistic History. Berkeley: University of California Press. I took a look at your site here because the is a young friend of mine, a Bajuni man whom the UKBA are trying to deport to Tanzania.He had come into the UK years ago on a Tanzanian Passport - but his situation was desperate as most of his family had been killed, and he had a grandmother living in the UK. Central to our campaign to help Ahmed is to prove that he is indeed Bajuni. The UKBA have used an anonymous language expert, who uses a short telephone call to assess dialect, but Ahmed had spent his teens in Refugee Camps in Kenya. This was very useful! I am indeed Bajuni and can speak it as well. Well enough for the elders to understand so I guess that's something! I know reside in U.S.